We found Elise's flower girl dress by being open to possibilities. The clerk at Dillards shook her head, "No, we only stock smocked dresses for infants, and even those are pastel." My eyes wandered to a rack of long white organza, each dress with a pink clearance tag. Could a 2-year-old really wear a baby's baptismal gown? For $16.49, it was worth a try. We think it worked out beautifully. That find turned out fabulously! She is beautiful. Such a pretty dress to. I know I would never have thought to look at infant baptismal gowns. I am just blown away by the way your mind works. Thank you for sharing your pictures with us. Beautiful! When my daughter served as a flower girl a few years ago, we also *discoverd* her dress in some hand-me-downs from a friend. It was perfect! I love this...what a clever woman you are! The dress is beautiful and, of course, there's no guilt for spending too much. How clever! And she looks darling! What a fantastic idea! She looks absolutely beautiful, Meredith. So happy for you and her ... she looks so sweet in her dress. Love that gown. What a great idea! Could that little girl be any cuter? She looks like spun sugar with an angel heart. So adorable! Beautiful! What a wonderful idea!! Wow, she is beautiful! What a wonderful idea. A beautiful picture of a beautiful girl! 'm getting tired of those flower girl dresses with the tank top, sash, and full skirt. Brilliant! And little flower girl is adorable. Well, I'd SAY it worked out! Just look how gorgeous she is! meredith - your baby looks like a little princess! what a find! Frugal creativity is wonderful, isn't it? At 16 bucks! NOT BAD! Excellent find! What a great idea - and your daughter looks so sweet in it! The sizing on clothes is so crazy...my dd is 9.5 and very, very slim. Yet I see clothes at the thrift store that barely look like they would fit her and have tags that read 14-16. What a clever idea, although I'm curious as to what size it was! It looks so beautifully vintage, too. It's just beautiful! What a great idea. SOOO smart! I love that idea! How truly precious. And I love your resourcefulness and reminder to not just read the tag size but look at the actual cut and dimensions. Oh, my goodness. It did indeed work out beautifully! 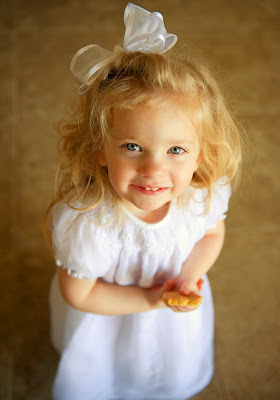 I might have to go look at Dillard's for some smocked dresses for Eliana- that is just too precious! Praise the Lord for His wisdom, and for inspiring you with such resourcefulness! Super neat. Very resourceful. I always go on ebay for that stuff. Got my daughter organza full length gown with embroidery and shoulder wrap for $16. But this? This was genius! Believe it or not, this dress is a 3 month size! I suspect they were sewn too big, and that is why so many of them were left on the racks at Dillards. In fact, I went there a couple of weeks ago, and there were still several of the same baptismal gowns on sale. Why didn't I just buy a regular dress? I couldn't find one! It was November, and I couldn't find anything on Ebay, at consignment, or in any of my regular stops. The fancy children's boutique had dresses with sleeves, but they were off-white--and we needed white. Most dresses had Christmas details, K-mart quality fabric, or a Strasburg price tag. (Which I offered to buy, if the bride had her heart set on one from the website, BTW). David's Bridal flower girl dresses were too big for a little 2-year-old. I was distracted by the sunny face; the dress turned out beautifully. I never would've even thought to try. The dress is sweet too, though you could put her in a paper bag and she would still look beautiful. On the other hand: she's also going to be flower girl for my lifelong best friend this week. The dress that my dd is wearing was purchased by the bride's grandmother, for me, when I was about 3. How's that for special and frugal at the same time? This reminded me of the time I needed a slip for my 3 year old. She had just grown out of her old one. We did not have the money for a new slip. But I had an old slip that didn't fit me. So- using the her old slip as a pattern I made her a new one. Sewn completely by hand. 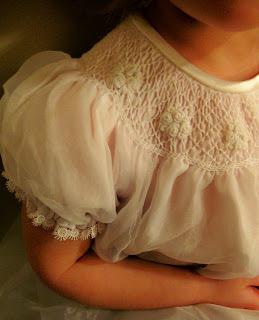 I even used the fancy lace that was on the bodice. Lots of fun too. Later this same daughter when she was a young teen would go to the girl clothing section to check out the Hello Kitty shirts, to see if any would fit her. Many times they did. Wow, Meredith! You really got a great deal on that dress. I make handsmocked dresses just like that, and I wouldn't make one for someone else for less than $100. WOW! You did GOOD! She looks lovely. And great find on the dress! I would not have thought of baptism dresses! The dress went all the way to her ankles (we turned up the bottom ham, as it was a little too long). She wore white stockings from Dollar Tree (great buys there!) and white patent shoes with little satin ribbons. What a great idea! I'm going to use that in looking for an Easter dress for my 2-year-old! Oh my! She looks so beautiful! It is beautiful! And what a deal! A dress and a memory to cherish, for sure. I'd like to invite you to join a new Proverbs 31-based blog event (and have a chance to win Donna Partow's new book on the topic). Stop by RefreshMoments to check it out. What size does she wear in regular clothes? My sister-in-law paid $200.00 for her flower girl's dress, and then the two-year old refused to walk down the aisle! I love reading about your frugal ideas. That dress is gorgeous! I love the sweet simple smocked outfits (my mom made them for my boys until they were old enough to demand something different!) and they are so hard to find. I can't believe the neck in that dress fit. It must have been huge on a 3 month old! Guess that's why they were there for the pickings, huh? wow! very nice. . .you'd never know! She is ADORABLE! What a great picture. I agree with you, she looks beautiful in that dress and can't beat the price! Now that's just flat-out brilliant! She looks beautiful!